Successfully Added GSM Smart Watch Phone - 1.3 Inch Display, Bluetooth 4.0, Heart Rate Monitor, Pedometer, SMS Syncing, Camera Trigger (Black) to your Shopping Cart. Get a stylish accessory and a useful gadget in one! This GSM smartwatch comes with stylish cool looks thanks to its 1.3 inch round display and has lots of great features. What's more, it lets you make and receive calls right from your wrist. Sometimes reaching for your ringing phone gets highly inconvenient. You may have it hidden away at the bottom of your backpack or you may be stuck on a crowded bus. What if you are in a meeting but still want to keep track of the messages coming in? Luckily, there is a solution. 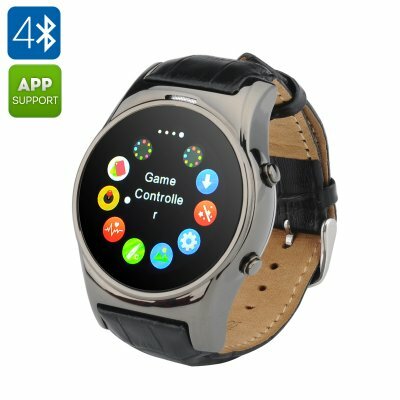 This GSM smartwatch looks like a classic accessory but comes with lots of hidden powers built-in. First and foremost, it comes with a SIM card slot, letting you make and receive calls right on your wrist. Simply insert a GSM SIM and you have yourself a secondary phone - ready and convenient to use on the go. The smartwatch comes loaded with health features as well. You’ll have the pedometer to track how active you are throughout the day. Then there is the heart rate monitor for general health monitoring. A sedentary reminder will make sure you don’t get stuck behind the desk, while a sleep monitor will track your sleep patterns. You can also sync the smartwatch with your primary phone: it is compatible with iOS 7 and above and Android 4.3 and above. With iOS 7 and higher, you can even use Siri on your smartwatch. Thanks to Bluetooth 4.0, you will have smooth connection with your phone at all times. The GSM Smart Watch Phone comes with a 12 months warranty, brought to you by the leader in electronic devices as well as wholesale GSM smartwatches..